Most of us have been brought up with the mantra ‘Never Give Up‘ engraved in our genes. We are taught from early age that persistence and perseverance will help us achieve our goals. 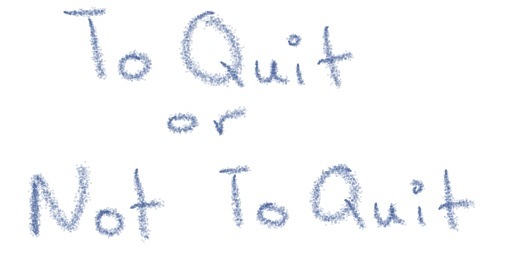 At the same time, quitting is seen as a sign of weakness – even for minor activities. A friend told me that the words of her father about never giving up echoed in her head, every time she was reading a novel that she didn’t like. As for myself, I was always surprised by those who left the cinema as soon as they realized that the film was not up to their expectations. The dilemma when to give up or not becomes prominent when you face important decisions about career progression. For example: do you push for your next promotion or do you change companies? Do you continue working in a sector you are not passionate about or do you make a career change? These are difficult decisions to make. Here are three key questions you need to ask yourself that can help you decide what course you take. Do you have realistic expectations? It doesn’t mean that you should not aim high. If you do, you just need to accept the fact that your goal may be hard to reach. Make sure you understand what skills and experiences are required to move to the next stage of your career and find ways to acquire them (e.g. cross-functional projects, short courses, etc). Don’t expect results fast – it may take some time to achieve what you want. Does the specific initiative you channel your energy helps you achieve your long-term objective? If you are clear where you want to be in 5 or 10 years, it will be easier for you to understand whether your short-term goal is worth the effort. For example: Does the promotion you have your eye on will help you to achieve your long-term objective or are you simply fixated with it just because your colleagues have already moved to the next level? If it doesn’t bring you closer to where you want to be in 5 years, let it go. By shutting one door, you may open others. Does reaching for your goal make you happy? If it makes you anxious, you need to rethink whether it is worth pursuing. It might be that your circumstances have changed and as a result this goal is not applicable anymore. Or you may have realized that the goal you were pursuing was not your dream but somebody else’s (e.g. you ended up becoming a medical doctor to satisfy your parents’ wishes). On the other hand, if it makes your life meaningful, you’d better continue even if your attempts have yet to yield results. If you answers are mostly Yes, then don’t give up. Everything worth doing requires effort. If the answers trend to No, then you have to rethink your overall objective. Expect doubt to creep in every now and then. It is perfectly normal. Use the opportunity to re-assess the situation and make appropriate changes. Your mentor may able to provide you an external perspective . Don’t let though fear itself stop you. Eliminate thoughts such as “I am not good enough” or “It’s too late now”. The Bottom Line: Having gone through the questions above, you will be able to decide when NOT to give up. Sometimes though, quitting is the best thing you can do. Have you faced this dilemma? How did you make the decision? Korina Karampela is the founder of b4iapply, author, consultant and speaker. She has held senior positions in the pharmaceutical industry for 12 years and has an MBA from MIT Sloan. Her blog b4iapply has been recommended by The Guardian for professional development. This article has also been featured in Huffington Post. This entry was posted in Before I apply, Career Advice, Professional development and tagged long-term career objectives, Never give up, when to give up, when to give up or not your career goals. Bookmark the permalink. These are three critical questions of the utmost importance – I would emphasize that assessing the situation continually is more critical than we may think at first. Markets change, people change, the economy changes and so do personal circumstances; a job in one sector may not be the ideal one in 3-5 years. So stay on top of these changes and, as Korina says – don’t give up, but adapt to the change(s). You raised an excellent point Vipan: continuous assessment of the situation is key. Thanks for the contribution. Thanks Korina for this great post. I can’t agree enough with your last bullet point. As has been famously said many times, while success is about getting what you want, happiness is about wanting what you get. It’s so important to periodically challenge ourselves to make sure that we’re pursuing our goals toward outcomes that we’ll want, rather than getting caught up in other people’s notions of success. Dan, thank you for your comment. You are very right about the distinction you make between success and happiness. I really love the quote ‘success is about getting what you want, happiness is about wanting what you get’. Maybe a way forward is to be happy with what you get while trying to achieve what you want. Do you think it is possible?